[INQ. NO. 1505M34] Daegu-based Young Auto has relatively short business history but rapidly growing into one of the nation’s leading automotive part manufacturers. The young and strong venture’s commitment is to deliver the best value to its customers in continuously pursuing the quality, service, technology and price utilizing global OEM’s purchasing and supplier performance development processes. The company maintains close business relationship with global OEMs and Top-tier suppliers such as GM-Daewoo, Hyundai-Kia Group, Ford, DCS, and Korea Delphi by providing exceptional solutions to engineering and business challenges utilizing the self-developed auto product-related exceptional technology. Current global trading partners of the company reaches 8 counties located in North America, the EU, and Asia. Young Auto is currently engaged in delivering a wide range of commodities in the area of electrical, metallic, chemical, and machinery and equipment mainly for Korea’s Tier 1 & Tier 2 suppliers. The company’s current manufacturing areas ranged from forging products, brake parts, steering parts, casting products, heat treatment parts, compressor parts, stamping products, to machined parts. [INQ. NO. 1409M09] 3A Clizen is a specialized company manufacturing high-quality automotive heat exchangers and automotive A/C compressor parts with TS16949 and ISO14001 certifications, according to strict quality management standards;It has achieved “Single PPM” defect ratios for products. 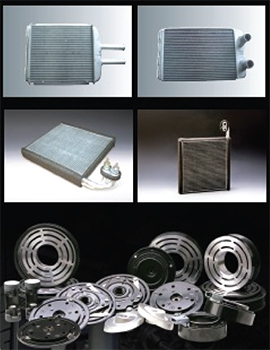 As a leading manufacturer, 3A Clizen offers aluminum, copper, and brass automotive heat exchangers and compressor products that are designed for vehicles and industrial applications. 3A Clizen was appointed as a technically innovative company, INNO-BIZ, and registered as a high technology venture business company by Korean government. The company’s automotive heat exchanger and compressoraredesigned and engineered to deliver excellent performance that makes automobiles possible to be almost perfect. These are the results of concentrated technology based on superior materials with excellent durability. Its products such as automotive condensers, automotive evaporators, automotive radiators, and automotive heaters & heater cores are also friendly to the global environment. 3A Clizen’s world class aluminum, brass, and copper heat exchangers have unique designs for each and optimize internal temperatures for automobiles,trucks, and buses with excellent heat exchange. The manufacturing system can provide clients with everything they need, ranging from OEM products to OES and aftermarket replacement for original components. Filed Under: Automotives Tagged With: 3A Clizen Co., automotive A/C compressor parts, Automotive Heat Exchangers, Compressor Parts, Ltd.
[INQ. NO. 1405M41] Daegu-based Young Auto has relatively short business history but rapidly growing into one of the nation’s leading automotive part manufacturers. Current global trading partners of the company reaches 8 counties located in North America, the EU, and Asia. Young Auto is currently engaged in delivering a wide range of commodities in the area of Electrical, Metallic, Chemical, and Machinery and Equipment mainly for Korea’s Tier 1 & Tier 2 suppliers. The company’s current manufacturing areas ranged from forging products, brake parts, steering parts, casting products, heat treatment parts, compressor parts, stamping products, to machined parts. Filed Under: Automotives Tagged With: Automotive Components, brake parts, casting products, Compressor Parts, forging products, heat treatment parts, stamping products, steering parts, Young Auto World Trade Co.Ltd.